Our specialty is Laser Photo Engraving. Over the last ten years we have refined our techniques and improved our products in order to get the best possible results. These ten years of refinments have resulted in high detail, high contrast engravings. Most companies who are production geared choose the quickest engraving techneque. This quick technique usually results in a low detail, line art type engraving. 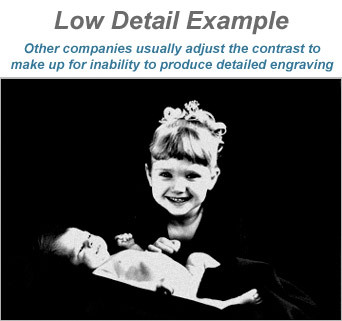 To achieve a high detail, photo quality engraving requires both skill and time. Experience: Just about anyone can use a laser to engrave simple text and graphics within a week or two. 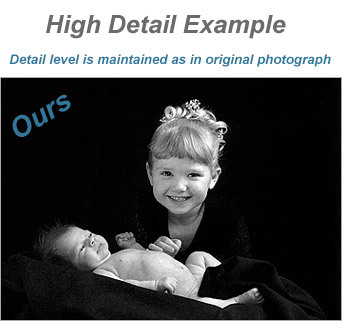 It takes a significate more time and training to get photo quality results. 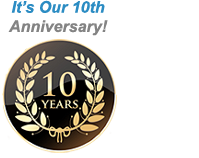 Our skilled engraver has over 9 years of experience in photo engraving. Engraving times: To put it simply, engraving at a low resolution require less time where engraving at higher resolutions takes longer. To cut corners and save time some companies will engrave at a lower resolution, this results in a lower detail/quality engraving. Since 2004 we have engraved at the highest possible resolution for each materal. Time: To get photo quality results with a laser engraver requires time in both the preparation of the photograph and the time spent in the laser engraver. The more time that is spent in preparing the photograph the better the outcome. We spend on average 45 minutes preparing the photograph and designing the layout. Companies who are production geared typically will spend about 15 minutes or less preparing the the photograph and layout. Our graphic artist spend the extra time to design the perfect layout you're looking for. Standard features included with every order. Materials: Engraving quality is largely dependant on the material used. A good example are black granite plaques. The smaller the grain in the granite and the darker it is, the better the engraving results. More detail in the engraving will always be possible using a smaller grain granite. 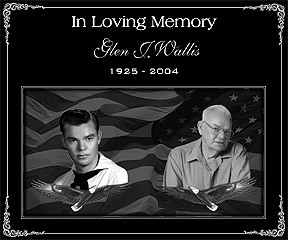 We use only small grain black granite for photograph engraving. 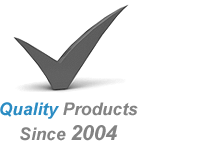 Since 2004 we have served our online customers with quality products with nearly 100% positive feedback. Don't take our word for it check us out at "The Better Business Bureau"
and see for yourself. Quality products & customer satisfaction is our goal. you can order one day and have it shipped the next day (weekends and holidays excluded).